At CAPE, we’re always going above and beyond for our clients, and that includes making house calls. When you need the crash-testing experts to come to you, CAPE is ready. With our rolling lab, CAPE engineers can answer complex questions at our customers’ facilities, in the field, or at off-site proving grounds. 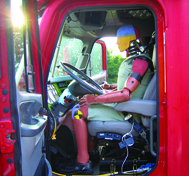 Using specialized instrumentation, portable data acquisition systems and high speed video systems, CAPE can equip your vehicles for accident reconstruction, studies of restraint performance and comfort assessments, as well as input on airbag sensor development. With CAPE expertise and specialized equipment, customers can meet a wide variety of testing objectives in various testing environments.